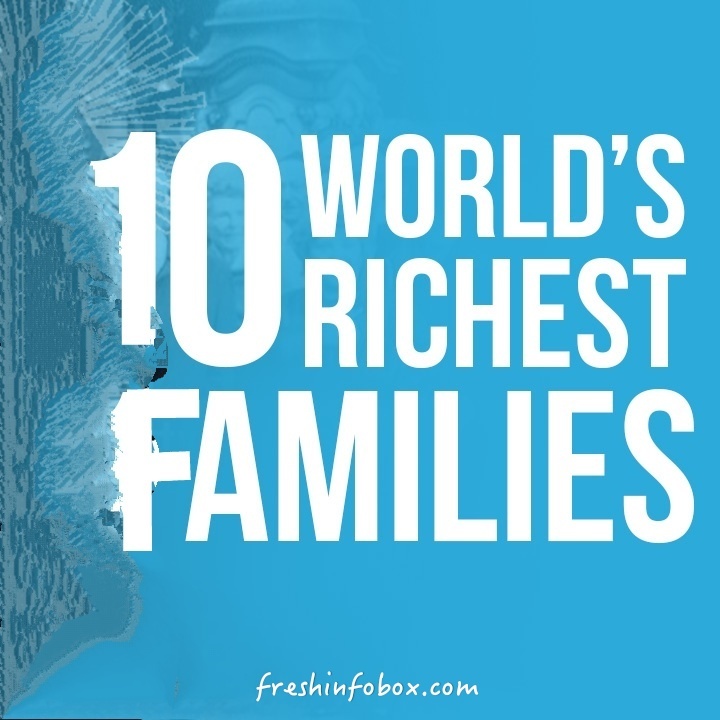 Top 10 Richest family in the world and, One indian also. Walton Enterprises and the Walton Family Holdings Trust running the retail company, Walmart, have topped the list of the richest families with sales of $500 billion from almost 12,000 stores worldwide. Koch Industries were started by brothers Charles and David who left their father's business due to a fraternal feud in the early 1980s. Started in the 1940s, today Koch industries has an annual revenue of about $100 billion. "David and Charles manage a portion of their wealth through a family office, 1888 Management," says the Bloomberg. Although it is a niche based company with only pet care products, it is making a revenue of more than $35 billion under M&Ms, Milky Way and Mars Bars. Frank Mars' company is closely taken care of by the family members. It is a collection of three Belgian beermaking families which has its roots in the 14th century. The evolution of these companies started when the Van Damme family merged with Piedboeuf and Artois in 1987 which led to the creation of Interbrew which further merged with Brazil's AmBev in 2004. "Verlinvest, an investment vehicle for some of the families, manages more than $2 billion of assets," says the Bloomberg. Hermes earned the name in the luxury fashion industry because of Jean-Louis Dumas, who died in 2010. Today, the company is taken over by the family members, including Pierre-Alexis Dumas, the artistic director, and Axel Dumas, the company chairman. Designer Coco Chanel started the fashion house in the 1930s in Paris. Today, his grandson's brothers Alain and Gerard Wertheimer are taking care of the brand. They have even introduced "little black dress" to the world and had revenue of $9.6 billion in 2017. Dhirubhai Ambani started Reliance Industries in 1957. He passed away in 2002 leaving a will, his widow brokered a settlement between her sons, Mukesh and Anil, over control of the family fortune. Although his possessions were divided between his sons, Mukesh Ambani owns the world's largest oil refining complex as well as a 27-story mansion that's been called the world's most expensive private residence, according to the Bloomberg. Herbert Quandt worked really hard make world's largest selling luxury vehicles under his brand -- BMW. He had died in 1982, leaving behind all his possessions for wife Johanna Quandt, who died in 2015. Now, their children Stefan Quandt and Susanne Klatten, own the company. Started by William W. Cargill in 1865, this one-grain storage warehouse in Conover, lowa, has become an industrial giant. This food, agriculture and industrial giant has been maintained by the family member.